I hate that last part – that “everything will work out for the best.” It makes me think of someone patting me on the back in a patronizing way as we both watch my life fall apart. The only way “for the best” works for me is if I’m happy. Anything short of that goal might be for somebody’s “best” but certainly not for mine. “For the best” is a phrase we use for the broken-hearted. It terrifies me to imagine living through something that falls into the “for the best” category. Again. 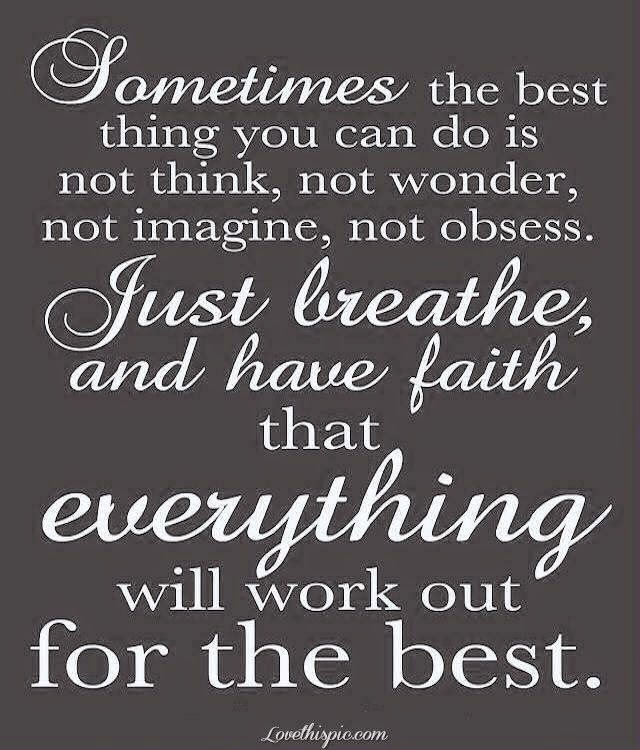 “Everything will work out for the best” is a consolation prize for the loser. You never hear someone say that to a person who gets a promotion or wins the Boston Marathon. You say it to the one who got laid off and to Shalane Flanagan for running her best race and still coming in 7th behind a bunch of foreigners. But the first part I like. I do think too much, wonder too much, imagine too much, and without a doubt I obsess too much. One of my favorite parts of the day is when I crawl under the cool covers and spend a couple of minutes thinking about the beautiful things in my life that make me happy. But when feeling my feelings begins to give way to thinking, wondering, etc. I get scared. When you spend so much of your life being miserable, and then something comes along that reaches deep into your soul and touches you like a magic wand, changing all the hurts to joy and happiness, you wonder every now and then how long it will last. You wonder when the shoe will drop – when the Universe will finally burst into laughter over its cruel joke in fooling you into believing that you were actually having a great life. You obsess. And then… ironically, you become unhappy. And it rubs off on all those around you, too. I can’t know tomorrow. No one can. But 5 years ago I could never have imagined today, so I’m not sure what I’m so worried about. If heaven and hell exist, I believe it’s in the form of Love and Fear, and they are in an age-old battle in a fight to wipe each other out. Fear is thinking too much. Fear is wondering too much. Fear is obsession. Love is letting go. Love is just being. Love is open and happy and free from the chains of worry and doubt. And nobody – nobody – pats Love on the back and says, “everything will work out for the best.” Love is glowing and shining and radiant and does not need to be comforted. And breathing… and badass happiness that chases away all the Fear. I choose it now – over and over and over and over again – and forever and ever.